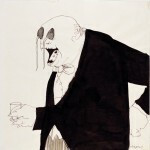 Contemporary artists are pushing their pens and pencils in new directions and letting viewers draw their own conclusions. Ellen Lesperance, December 12, 1983: Standing Beside the Communal Campfire, She Read Aloud From The Front Page News: “Women at War! 25,000 in Greenham Base Demo,” 2012, gouache and graphite on tea stained paper, 26 x 34 3⁄4 inches. 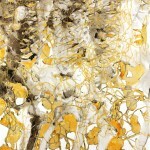 Katina Huston, Nasturtium With Gold, 2014, ink on mylar, 46 x 40 inches. Hilary Brace, Untitled (March 2014), 2014, powdered charcoal on polyester film, 8.25 x 13 inches. Gilman says that the show “fits into a larger trend of an expansive definition of drawing, of artists calling work ‘drawing’ that one would never traditionally understand as drawing.” And yet there is something traditional about it. Drawing is about pattern and structure. 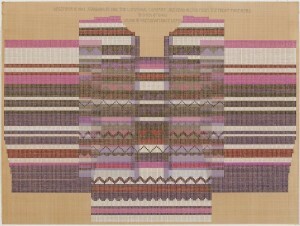 Lesperance’s drawing, for example, is a free-standing work, but it can be experienced as the preparatory drawing for a woven piece that exists only in the imagination. Think of the “underdrawing” of a painting. The original “thread line” was Ariadne’s thread, which guided Theseus through the Minotaur’s labyrinth, an archetype of the guideline, the line as imposer of order on chaos. Among Florentine Renaissance artists, drawing was fundamental to all artistic practice in any medium whatsoever, and the word they used for drawing, disegna, literally means design—the creation of a pattern, by means of line, that will guide the composition and the application of materials. In the emphasis on process in the drawing practice of many contemporary artists, and also in the expansion of drawing to embrace various media, we may be seeing a sort of return to disegna, albeit in a different context and with a new kind of self-awareness. 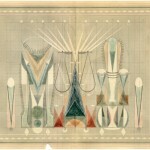 One artist who revels in patterns is Louise Despont. Based in New York, she spent 2010 in India on a Fulbright fellowship studying tribal geometric paintings, Rajasthani Tantric drawings, and Hindu temple architecture. What she saw there informed her drawing in several ways. She uses stencils and drafting tools with black and colored pencils to make intricate geometric designs that come together to make figures, floral and leaf patterns, arabesques, and symmetric, symbolic shapes influenced by both Indian and American Indian iconographies. There is very little illusionistic effort here; the space in Despont’s drawings is usually flat, or if there is a suggestion of the third dimension, it is in the form of an anamorphic architectural rendering. 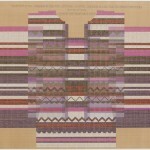 Her drawings suggest sand paintings, carpets, or perhaps patterns for carpets. She lays her fantastic imagery down on reclaimed antique ledger paper, mostly from the British Raj, so that a grid or black, blue, and red lines—and sometimes lines of printing or handwriting—underlies the drawing. A certain quality of busyness or density of detail is evident in the works of a good number of contemporary practitioners of drawing. British-born artist Suzanne Treister packs a dizzying amount of information and imagery into her colorful ink drawings, which reimagine Tarot cards and Hermetic world-diagrams for the cyber-age. 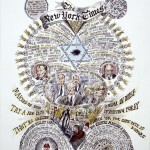 Her series of 22 drawings for the Hexen 2.0 Tarot (2009–11) uses the traditional format for the cards but fills the picture space with a plethora of short texts that outline relationships between the occult, technology, government, the military-industrial complex, science fiction, and more. Amid the cheerfully, decoratively colored fields and curving lines of lettering, imagery rendered in a style influenced by comics and graphic novels tells a weird tale. Treister’s rendering of the 16th card of the Major Arcana of the Tarot, The Tower, is all about government cyber-surveillance, with the traditional crumbling, lightning-struck tower replaced by the ominous, block-like headquarters of the NSA. The Chariot, card number 7, portrays Norbert Weiner, the founder of cybernetics, surrounded by the sun, the moon, an array of mathematical equations. A sort of potted bio-bibliography of Weiner is ingeniously packed into the interstices of the mandala-like design. The Fool, the “zero” card in the Tarot, is Aldous Huxley, shown amid a psychedelic, surrealistic swirl of references to mind-expanding drugs. In a watercolor-and-felt-tip-pen drawing, Alchemy/Jüdische Allgemeine (2008)—not part of the Hexen 2.0 series—a German-language account of Jewish history is layered into a beautiful diagram of cosmic creation modeled on one the engravings in an 18th-century edition of the works of the German mystic Jacob Boehme. Treister has said that the material in Hexen 2.0 “is based entirely on existing material and not invented by me.” For Treister, drawing, writing, and the imparting of information are intimately bound up with each other. An even greater density of detail is to be found in the astonishing, eye-challenging drawings of Adam Dant. Inspired by 18th-century English prints, especially those of William Hogarth, the London-based artist creates huge, complex cityscapes in ink and watercolor that comment on the meaning of today’s urbanism. In The Meeting of the Old and the New East End (2012), gentrification is explored in a way that eschews generalities; in fact, there are dozens, if not hundreds, of specific examples visible in the drawing, if you look hard enough, form the signs on the stores to the people interacting with each other in the streets. Even the insides of the offices and apartments are visible through the windows. Grand Central (2011) depicts the iconic New York train station under construction—or is it being dismantled? Like Treister’s, Dant’s work has a strong narrative impulse, or at least an editorializing quality, and he is quite willing to use text when necessary. Dant’s Art World Atlas (2007) is a genuine triumph of cartography as well as a work of spot-on satire, with names named and no one spared. Another artist who plays with text—albeit in a very different way—is Paul Sietsema, whose artistic practice is multimedia and includes video and sculpture as well as drawing. Sietsema likes to draw from photographs—but that doesn’t mean that he uses the photos as inspiration or reference; it means that he literally reproduces the photograph as an object, including its borders and surface texture, and the irregularities of the paper it was printed on. He doesn’t intend these painstaking ink drawings as trompe-l’oeil triumphs; what they really are is meditations on the nature of reproduction and image-making itself. In his Ship Drawing (2009), he shows both the front and the back of a photograph, asking us to wonder which is more relevant. Sietsema is also fond of doing drawings of newspaper and magazine pages, in which the typography, originally made by machine, is redone by hand. By taking the time needed to do this, Sietsema is forcing himself—and us—to slow down, in a sense reclaiming the contemplative kind of time that we lose to the rapid communications of the digital age. Whether illustrators by profession or not, the rendering skills of these artists point to another trend in drawing today—the return to representation. “There’s definitely a prevalence of representational, illusionistic work,” says Gilman, “a return to drawing’s basic function of representing the world, like it was before photography. There are still artists working abstractly, but we’re seeing less of that.” Even some of those who do fundamentally abstract work are using figural or even strikingly realistic building block to create their abstractions. That is what West Coast artist Hilary Brace does with her charcoal-on mylar drawings. Works such as Untitled (March 2014) are quite abstract, all about masses and movement, but they are also fantasias about weather. 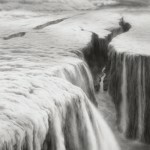 Brace’s raw materials are clouds, mist, water, and ice, and after looking closely at her drawings the viewer is apt to be undecided about whether these are cataclysmic events in some future global warming endgame scenario or just deployments of form and shadow. Katina Huston also draws abstractly on mylar, though her works contain color. Works of hers such as Nasturtium With Gold and Map of the World layer elements that suggest nature, such as leaves, petals, and branches, in a collage-like fashion on a transparent background. Huston hangs actual leaves and other objects from the ceiling of her studio to let light shine through them and then draws the glowing shadows they make. The result is both naturalistic and abstract.